Inebriated patients in a crowded room thrashed and yelled. Some patients were undermedicated. Others were restrained unnecessarily, he said. He watched a security guard put a female patient in a choke hold, causing another caregiver to gasp. At least two patients died while he was there. In the spring, one patient died, then on July 11, a suicidal woman hung herself. The Unity Center for Behavioral Health is at risk of losing its federal certification and reimbursements from Medicare & Medicaid after a state investigation discovered the death of one patient, at least one instance of sexual assault, negligence and a long list of other ongoing safety hazards. Five mental health professionals told The Lund Report in the past few days that they were not surprised by the violence. They said its open-plan model for patient care invited attacks. A large part of the problem, they said, likely stemmed from the financial incentives to centralize care. “The size was daunting to provide the safe environment for staff and for patients,” said Tim Murphy, CEO of Bridgeway Recovery Services, a mental health and addiction care center in Salem. The Unity Center opened in February 2017 as a collaboration among four of Portland’s major health organizations. 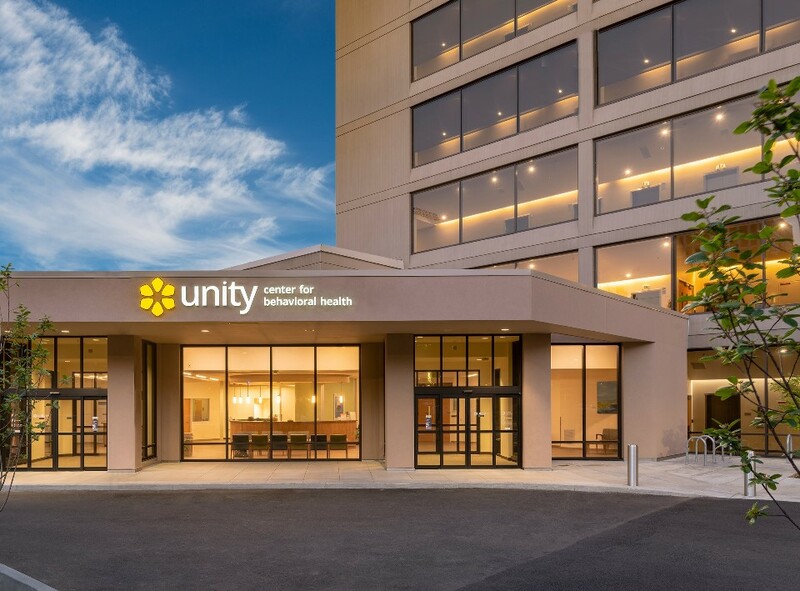 Adventist Health, Kaiser Permanente, Legacy Health and Oregon Health & Science University closed their individual psychiatric departments and opened the Unity Center as a central destination for patients experiencing a mental health crisis. The center implemented a model of care developed in Alameda County, California, to help psychiatric patients get quick help. Instead of going to a traditional emergency room, with limited psychiatric beds, patients are taken to a center specialized in dealing with health care crises. At Unity, they’re placed in one large room with about 50 recliner chairs, where they are evaluated by a psychiatrist and attended to by caregivers. They can stay there for as many as 23 hours before being moved to a private room or released into the community. They share their private psychological details in an open room with no privacy curtains shielding them from other people. The last place a person experiencing a psychotic episode wants to be is around other people in mental distress, said another mental health worker who has experienced mental health crises. That person, who requested anonymity because the individual does work with Unity, said that a patient in crisis needs to be in a safe, stable environment where they're not at risk of getting pulled into someone else's delusion. The setting put both patients and staff at risk, Monaco said. Staff shared stories about worker injuries with Monaco, including a time that a social worker got two black eyes after a patient pummeled the worker to the ground when there was no security around to help. Another patient ended up stepping in to help, Monaco said. Two former nurses sued the Unity Center in February for more than $1 million each. They claimed that the center fired them after they complained about safety concerns, including assaults and serious injuries. One lawsuit noted that an Oregon Occupational Safety and Health Administration investigation found hundreds of assaults. One lawsuit was dropped, but the other is ongoing. A lack of clear protocols made an unsafe situation even more chaotic, Monaco said. Unity staffers who came from Adventist Health, Kaiser Permanente, Legacy Healthy and Oregon Health & Science each brought with them different care philosophies. Some were quicker to restrain patients to avoid staff injuries, while others believed in giving patients space to express their frustrations, even if they were loud or disruptive, he said. Monaco reported his concerns to his supervisors at the Multnomah County Health Department. He said his boss told him that what he reported was not the county’s liability and therefore not their problem. Multnomah County spokeswoman Julie Sullivan-Springhetti told The Lund Report in a statement that the county has launched an internal audit of its procedures for dealing with complaints. It will report those findings to its partner agencies and the broader public. Monaco then wrote to Unity’s vice president Chris Farentinos in a May 2017 email obtained by The Lund Report. He encouraged her to talk to her staff members from Adventist who had told him that “Unity represents a 10-year setback in patient care.” Staff felt alienated, he told her. “Our leadership team is working diligently on planning and implementing a culture development plan that over time will bring our Unity staff much more in alignment with a trauma informed, recovery and patient centered culture,” she added. Throughout May, Monaco sent several follow up emails to Farentinos, including one about a patient who he felt was experiencing “abusive” treatment. His bosses told him to stop contacting Farentinos. Farentinos did not respond to a request for comment. Legacy Health spokeswoman Julie Reed instead sent a statement responding defending Unity’s care model. Reed did not answer questions about Unity’s care model, finances or the number of filled beds. While the opening of Unity centralized emergency psychiatric care, it also concentrated risk by limiting patients’ care options. “When Unity was created, they put most of their eggs in one basket,” said Bob Nikkel, a board member at the Foundation for Excellence in Mental Health Care and Oregon’s former commissioner for mental health and addiction. Now, Unity is one of two places to go for patients experiencing a mental health crisis. The other is Providence St. Vincent Medical Center, which saw an increase in admissions after Unity abruptly stopped accepting patients transferred by law enforcement, medics and other hospitals. Cedar Hills Hospital also offers mental health services, but only takes patients based on certain criteria. Patients must be “actively suicidal,” homicidal or unable to care for themselves in order to get admitted to inpatient care, Cedar Hills CEO Libby Hutter said in an email. The hospital has 94 inpatient beds and usually more than 90 percent of them are filled, Hutter said. Unlike Unity, Cedar Hills separates patients into different units based on specific behaviors and needs. They have a crisis unit for patients who have difficulty controlling their behavior and a separate psychiatric unit for depressed patients who are not acting out, Hutter said. “Our organization believes it is best for patients to participate in specific programming that is focused on their psychiatric or addiction issues,” Hutter said. She declined to comment on Unity’s different model. The Unity Center has more than 100 beds, which puts all of those beds at risk should the center fail. Nikkel was among five mental health officials who questioned whether the high costs of mental health influenced the four hospitals’ decision to fold their services into a larger facility. Personnel are the most expensive part of running a hospital, they said. Mental health facilities require around-the-clock care, which means paying for providers adds up quickly, regardless of the facility’s size. Meanwhile, providers are typically only able to bill Medicare and Medicaid per patient bed, they said. Centralizing care enables health-care facilities to hire a larger pool and to receive more reimbursements due to the increased number of beds. Monaco said that financial decisions likely also impacted Unity’s care model. He said perhaps two psychiatrists told him the system was an important part of the funding stream. It allows the hospital to bill for the time that patients spend in the emergency services area in addition to billing for the time they spend in an inpatient bed, he said. Murphy, the Salem mental health care provider, said he could not speak to Unity’s financial situation, but said that mental health care gets more expensive every year. “When there is a lot of budget pressure, that’s when staff-to-patient ratios go down, corners are cut, patients start to feel less safe and conflicts arise,” he said. At least 23 patients experienced “actual or alleged” abuse or neglect. Patients at risk of self-harm were given pencils and pens, rigid plastic utensils, shaving razors, cords, pillow covers, string and scrub pants and other items they could use to hang or smother themselves. One patient with a history of cutting was given a razor to use while “supervised” in the shower and cut themselves. The facility did not mitigate risks associated with sloped doors, hinges on the tops of doors and gaps between horizontal grab bars on walls that could increase risk of hanging or binding, the report said. Patients lacked adequate supervision when in high-risk or vulnerable areas. Majority of patient rooms had “blind spots” in camera views that included places where hanging was a risk. The hospital had no written process for responding to emergency situations. Emergency medical devices such as oxygen tanks, blood glucose meters and wound dressing supplies were not consistently stored or available in times of emergency. Patients’ rights were not protected or promoted when restrained or isolated. The staff who restrained or secluded patients were not properly trained. The hospital corrected several of the most glaring issues in May after state investigators put the facility on notice. They removed plastic utensil dispensers from patient units, closed gaps on grab bars and locked patients’ bathroom doors when not used by a patient under staff supervision. Unity also established policies for preventing patients from running away and planned to conduct “environmental safety rounds” twice a day where they check for safety hazards. It ordered carts stocked with emergency medical supplies and placed them in all units. Terrett shared a plan of correction describing steps the center plans to take in order to address the problems described in the report. The 77-page document includes plans to retrain its nursing staff, evaluate hanging risks and other hazards in the building and better document patient emergencies. The center has until Sept. 11 to correct the problems described in the Oregon Health Authority investigation. If it fails to do so, it could lose its certification. Reach Jessica Floum at [email protected].